But I am holding my breath. And I'm turning blue! You're not going to let a cuttlefish outwit you, are you? So we're NOT having cuttlefish for dinner? Don't outwit them - slap them into a nice warm oven drizzled with some nice olive oil, a dash or two of good white wine vinegar, a decent squeeze of lime and a tiny pinch of dried chilli flakes for a few minutes and they'll give up all their secrets. I'd been wondering what you were up to. You've gone diving again with me, haven't you? Missing you.. .where ARE you? Hey Jayne! Deep breath, honey, I may be a while. A single cuttlefish would not be an issue for me. But a network of them, a Collective if you will, is a different story. Hey Eolist! You're not kidding, and we're not even at sea. Hey Alistair! Not so easy, sadly. The mobile units they designed (shades of Genesis of the Daleks have resisted our best tin openers. And their Primarch is protected by that melted-plastic stuff that some online deliveries now come in; we have no idea how to get past that. Hey Joshua! Afraid not, they're loosely related. By marriage. Hey Blissed-Out! It's been tough, Nancy, and slightly slimy. Okay, very slimy. But I'll get back as soon as I'm able. Hey Lass! I love scuba diving (in an enthusiastic-but-unqualified-kind-of-way), and to tell the truth I'm rather fond of cuttlefish. Dazzling little fellas! But they really shouldn't be left in charge of National Defence (in a SkyNet-kind-of-way). Hey Anonymous! Well damn, you say the nicest things! This story may have to wait, but there's others ready to roll. Watch. This. Space. Haha! I can hold my breath for a long time! Hey 'Difficult! At least you could find your bed! Hey Kato! Good grief, you can? We could have done with you there for the exciting final underwater scene! 'Difficult is asthmatic, and I didn't want to get my suit wet. Seems to me we had a cuttlefish strapped rigid to the parakeet's cage when I was little. It didn't bother nobody. Uh, that's budgie to you. Jeez - I go away for a while, come back and you're not here waiting for me with open arms! WTF!!! Hey Murr! That was a decoy, darling. The real cuttlefish was watching the cage from a tank behind the curtains. And you wondered why that bird was so highly strung. Hey Kitty! Wonderful to see you! I thought you'd been eaten by a Yeti in the Alps! Last time I heard from you, you were up a mountain, smelling like a goat, and wondering what the hell you were doing. I shall hunt you down! Assuming you've showered, of course. 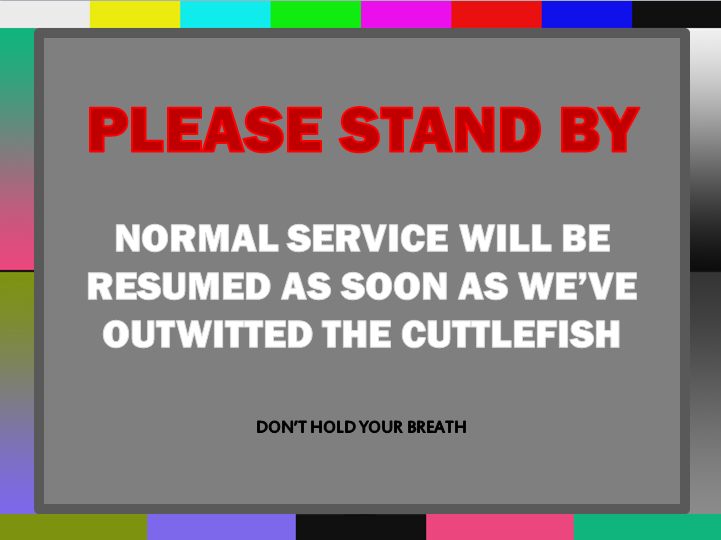 Damn the cuttlefish! Full speed ahead! Hey Boom Boom! Wise words, m'love! ONWARDS!